He made it, and the next one, and sank two more attempts to finally put the Irish away in the Cavaliers’ 60-54 victory on Saturday. “I never doubted I was going to make them,” said Guy, who finished with 22 points. De’Andre Hunter added 20 points, 13 in the second half, and 10 rebounds for the Cavaliers, who several times seemed poised to take command only to see the Fighting Irish come back. 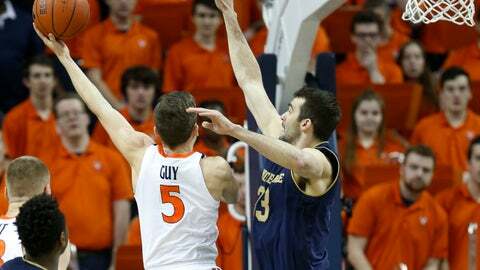 Notre Dame ultimately closed within 54-52 before Guy’s free throws sealed it. “I looked like Antonio Brown on that catch,” Guy said, comparing himself to the Pittsburgh Steelers’ star. Notre Dame coach Mike Brey was pleased with his young team’s effort. Gibbs scored Notre Dame’s first 10 points and was the only Irish player to score until Harvey’s basket with 6:41 left in the first half. Guy scored Virginia’s first eight points and was the only Cavaliers player to score until Ty Jerome’s 3-pointer with 11:15 left in the half. Notre Dame: The Irish nearly pulled off a stunning upset against a Virginia team that hadn’t played since Monday and shot the ball poorly (19-52, 36.5 percent). The Cavaliers won 82-55 when they played in South Bend, Indiana, on Jan. 26.